These actions weren’t without precedent in European history (England, for example, expelled its Jews in 1290) and weren’t the last act of intolerance, either, but they put the nation that would become Spain on a very clear mono-cultural path, rather than the mix of cultures that had lived together with varying degrees of tolerance over the centuries. Like Córdoba to the south, Toledo preserves in its religious architecture memories of what Spain once was in the form of churches, synagogues, and mosques. In fact, two of the three surviving synagogues left in the country are in Toledo (and you can find the other in Córdoba). 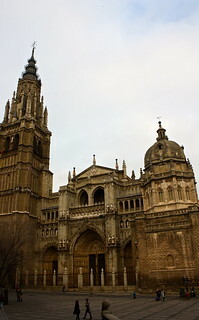 Probably the most important church in Spain is Toledo’s cathedral, which serves as the “primate” church of all Spain—this means that in Roman Catholic hierarchy, the church’s archbishop holds primacy over the other archbishops in the Spain (historically this meant authority, now it’s just a nice honor). So the cathedral can be thought of as a mother church for the country. 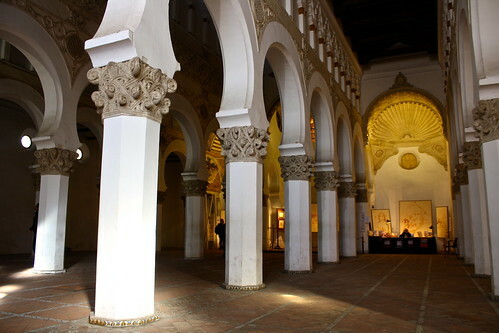 After the city was conquered by the Christians from Moorish rulers in 1085, the central mosque was allowed to remain in use under direct orders from the king, buuuuut while he was gone this edict was, uh, forgotten, and the mosque became a cathedral a là Córdoba. Two centuries later construction began on a brand-new, Gothic-style church, the one that remains today. 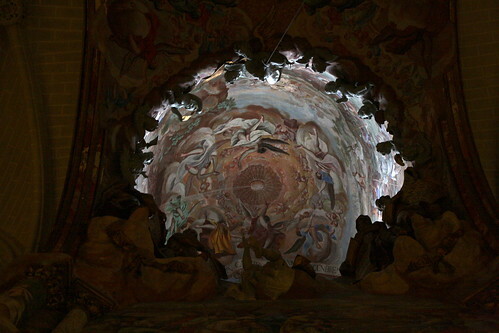 The city’s cathedral is home to numerous paintings by Renaissance painter El Greco, and also contains El Transparente, a beautiful skylight in the back of the apse (the round bit behind the central altar) that shines light upon an intricate altarpiece in the ambulatory. In college one of my Spanish professors had shown us a blurry VHS tape about Toledo that talked about the Transparente but I couldn’t really understand its significance until seeing it in person. From the imposing Church of San Ildefonso (a.k.a. Church of the Jesuits), I climbed up the bell towers to get some superb views of whole city. Some photographs I took include the main one at the top of the blog post with the cathedral in the foreground and the Alcázar in the background. The small Church of San Román is actually no longer a church but the Museum of Visigothic Art. 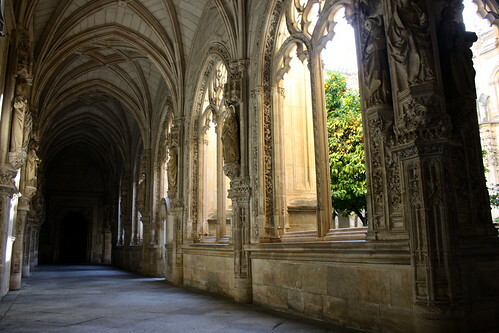 Inside, you’re greeted by dazzling striped horseshoe arches, Romanesque frescoes, and Visigothic artifacts. The outside of the former church is robed in warm pink brick and its bell tower is covered in Moorish-style arches and decorations, looking almost like a minaret. Inside the Church of Santo Tomé hangs a masterwork by Greek-turned-Spanish Renaissance painter El Greco, his Burial of the Count of Orgaz. This massive painting depicts the Count of Orgaz’s 1312 burial, in which, according to legend, St. Augustine and St. Stephen descended from heaven to personally lower him into the ground. After all, the Count was a philanthropist during his life and donated much to the Santo Tomé church in his will. There’s just so much going on in the artwork that I stood there for ten minutes just taking it all in. El Greco even painted himself and Miguel Cervantes (author of Don Quixote) into the scene. Cute. What’s really interesting is that right beneath the painting is the Count’s coffin, so you can see, in the painting, the saints lowering his body, and then just below the edge of canvas, where he actually rests today. Speaking of graves, in the Convent of Santo Domingo El Greco himself is buried. It’s a huge building but right inside the entrance is a little glass window in the floor you can peek through and see the famous painter’s coffin resting in the city that was the subject of many of his paintings. 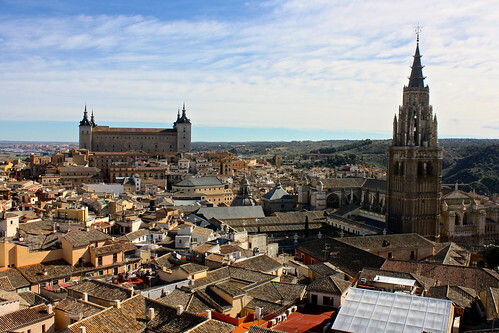 Finally, the Monastery of San Juan de los Reyes was built by the Catholic Monarchs—the same Ferdinand and Isabella—smack dab in the middle of Toledo’s judería or Jewish quarter. Rude, yes. More pretty Gothic architecture, also yes. The monastery’s chapel is a massive, airy single-nave structure complemented by an intricate two-floor cloister and a nice garden. 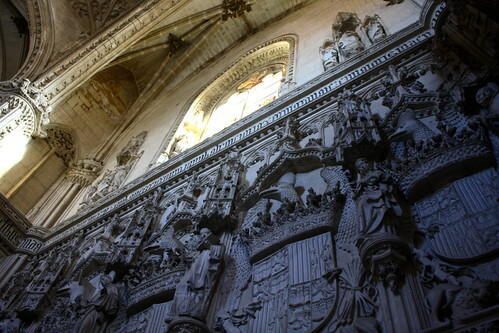 Ferdinand and Isabella ordered the monastery’s construction to commemorate their victory at the 1476 Battle of Toro in which their marriage (and the union of the kingdoms of Castilla and Aragón) was solidified, although they chose to build it in the Jewish quarter to “demonstrate the supposed supremacy of the Catholic faith,” according to the Lonely Planet. It was originally intended to be the mausoleum of said 15th-century monarchs, but after they managed to conquer Granada, they decided to build the Capilla Real and be buried there instead. The chains of Christian prisoners from Granada still hang today on the side of the building. Like I said above, two of Spain’s three remaining intact synagogues are found in Toledo, and the biggest and most stunning of the three is the Synagogue of El Tránsito. Named for the church it became after 1492 in reference to the Virgin Mary’s Assumption or “transit” into heaven, it was built in 1356 in the mudéjar style, so beautiful geometric plasterwork abounds and a warm wooden ceiling caps the large rectangular space. Although it’s not a functioning synagogue, it does house a museum dedicated to Sephardic culture, that is, the culture of the Jews who once lived on the Iberian Peninsula. Just a short walk away is the Synagogue of Santa María la Blanca, named because it was later a church and is still managed by the Catholic Church today. The oldest synagogue in Europe still standing, it was built in 1180 not long after the Christian conquest of the city. 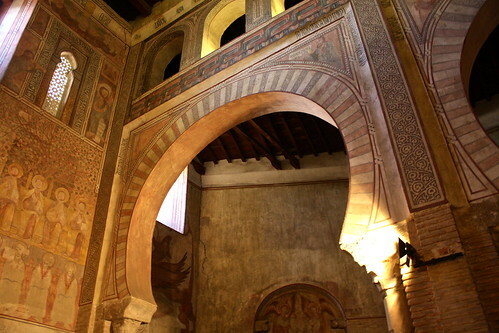 Because of this, its design (done by a Muslim architect) makes it look more at home in northern Morocco than in medieval Europe: tall, clean white horseshoe arches dance from pillar to pillar and create a wide, light-filled space. The tiny modern-day Church of El Salvador was once a mosque, and you can see remnants of the old structure in three large horseshoe arches in the back patio as well as in the bell tower, which still uses the stone construction of the old minaret. The Cristo de la Luz Mosque, however, was much more impressive. 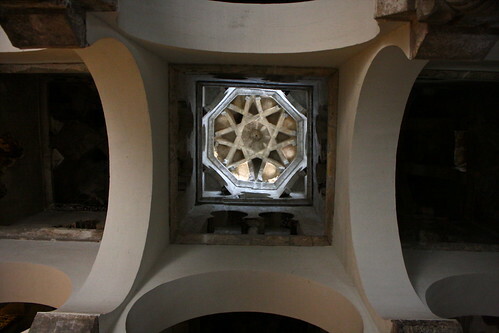 Over 1,000 years old, this simple, square-shaped structure has a surprisingly well-lit dome that contrasts with the dark ceiling. Horseshoe arches (I think we’re seeing a theme here…) bounce from column to column, and those columns each have different capitals, indicating that they were probably reused from older Roman or Visigothic buildings. Like most mosques after the Christian conquest, it later became a church, as evidenced by the semicircular apse added on to the eastern wall. This mosque sits in a quiet part of northern Toledo, near a Moroccan-style tetería (tea house) run by Spaniards who play Ella Fitzgerald and Enya over the speakers. Oh, Spain. 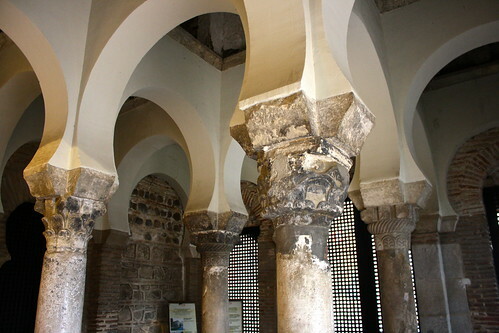 I didn’t have the chance to visit the Mosque of the Tornerías, but apparently it remained in use as a mosque after the city’s conquest until the time of the Catholic Monarchs—about 500 years. The site that today’s Alcázar (“fortress” or “palace”) sits on today—a high hill overlooking the city—has been important since Roman times. When the invading Visigoths set up a kingdom on the Iberian Peninsula, they made Toledo their capital and said hill their royal residence. 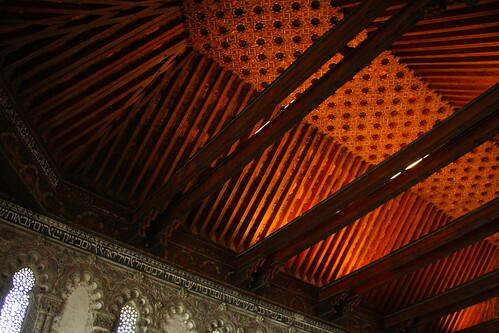 During Spain’s Moorish era, this place continued to hold strategic significance. In the 900s, the powerful caliph Abd ar-Rahman III ordered an al-qasr built, from which the modern Spanish word “alcázar” derives. Fast forward to the Christian conquest and a European-style castle was constructed in a patchwork of styles over the next few centuries. During the 16th century, King Carlos I had the palace redesigned in an orderly, square Renaissance plan. 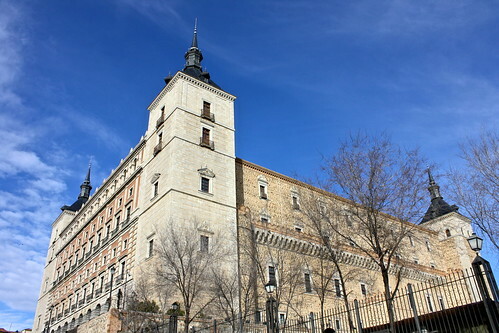 Although the royal court eventually abandoned Toledo in favor of Madrid as a permanent capital, Toledo’s Alcázar remained a royal residence. 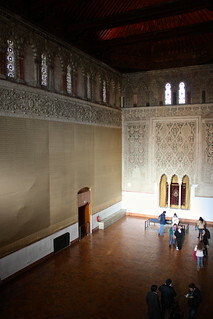 The Alcázar caught fire, was bombed, and was rebuilt several times in modern history: after the War of the Spanish Succession, Napoleon’s invasion, and the Spanish Civil War. Spanish dictator Francisco Franco had the whole complex completely rebuilt after its siege and destruction in said civil war, and it has housed the country’s Army Museum ever since. Recently remodeled, the museum would be a military history buff’s dream, with hours’ worth of interesting exhibits (in Spanish and English!) on not only Spanish history but also how their army changed over time. 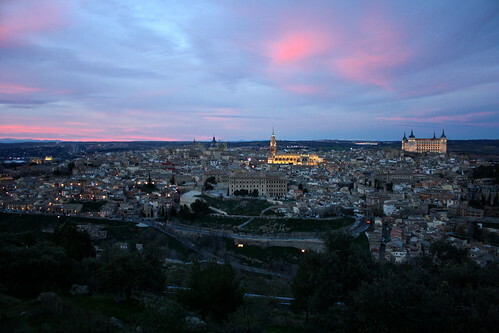 Would you ever consider taking a day-trip from Madrid to visit Toledo? What are the lessons the city can teach us for contemporary society? Start the discussion below!